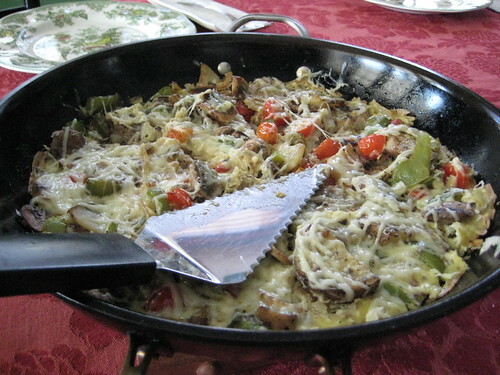 Breakfast frittata by Sam's mom. I just discovered a cute web series called “Couple Time,” about the things a couple says and does when they are alone. My favorite installment is the one where the girlfriend offers to cook her boyfriend “a king’s breakfast” if he gets up to feed the cat. I think the most royal breakfast I’ve ever experienced was last December at Sam’s parent’s house. They made challah French toast, a breakfast frittata, sliced melon… and we ate it in the dining room on breakable plates. What would be a king’s breakfast, in your book? Could you actually cook one if you needed to bribe someone with it?